We are pleased to offer students within QCUSD the opportunity to participate in preschool and prekindergarten. We have a variety of programs designed to suit your child's specific needs. 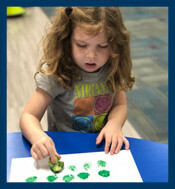 New for 2019-2020 full-day preschool option with extended care available. Please see our registration page for more information. Please contact our preschool coordinator, Aubrey Ruhser,at (480) 987.5958. You may also call our district office at (480) 987.5935 for more information. Coyote Pups is a program for children between the ages of three and four years and will offer the opportunity for an introduction to a school program. Classes will be taught by an AZ Highly Qualified and Certified Early Childhood/Early Childhood Special Education teacher. The class will also have a highly qualified para-educator in the classroom. 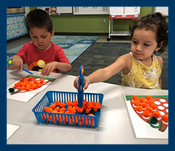 The curriculum in the classroom will adapt the Arizona College and Career Academic Standards through the AZ Early Learning Standards along with the Creative Curriculum for preschoolers, providing quality learning experiences and skill development. There will be no more than 16 students in each class. Classes meet at QCE/GPA: T & TH 8:50-11:20 a.m. or 12:40-3:10 p.m.
Children must turn three prior to September 1, 2019, and be toilet trained. If your child was born on or before August 31, 2015, they are too old to register for this class. Tuition: $50.00 enrollment fee (non-refundable), plus $120.00 per month from August thru May. Annual tuition paid in full includes a 10% discount = $1080.00. Kinder Prep 3 is a program for children that will turn four years old on or before December 31, 2019. Classes will be taught by an AZ Highly Qualified and Certified Early Childhood/Early Childhood Special Education Teacher. The class will also have a highly qualified para-educator in the classroom. The curriculum in the classroom will adapt the Arizona College and Career Academic Standards through the AZ Early Learning Standards along with the Creative Curriculum for preschoolers. This class has daily learning experiences and skill development that will help prepare your child academically and socially to enter kindergarten. The maximum class size is 17 students. Classes will meet at QCE/GPA: M-W-F 8:50-11:20 a.m. or M-W-F 12:40-3:10 p.m.
Children must turn four on or before December 31, 2019, and be toilet trained. Tuition: $50.00 enrollment fee (non-refundable), plus $150.00 per month from August thru May. Annual tuition paid in full includes a 10% discount = $1350.00. 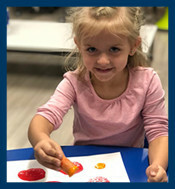 Kinder Prep 5 is a preschool program for children that will turn four years old on or before August 31, 2019. This class will be taught by an AZ Highly Qualified and Certified Early Childhood Education Teacher. The class will also have a highly qualified para-educator in the classroom. The curriculum in the classroom will adapt the Arizona College and Career Academic Standards through the AZ Early Learning Standards along with the Creative Curriculum for preschoolers. This class has daily learning experiences and skill development that will help prepare your child academically and socially to enter kindergarten. Class size will be capped at 20 students. Classes will meet at QCE/GPA: M thru F 8:30-11:15 a.m. or M thru F 12:30-3:15 p.m.
Children must turn four on or before August 31, 2019, and be toilet trained. Tuition: $50.00 enrollment fee (non-refundable), plus $265.00 per month from August thru May. Annual tuition paid in full includes a 10% discount = $2385.00. QCUSD preschool is excited to offer full day preschool for children ages three to five. The program hours are 8:30 a.m. to 3:15 p.m., Monday through Friday. Full day preschool classes are contingent upon student enrollment. Classes will be taught by an appropriately certified early childhood education teacher. The class will also have trained para-educators in the classroom. 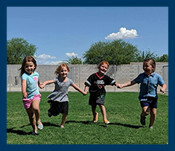 The curriculum presented is standards-based using the Arizona Early Learning Standards in conjunction with the Creative Curriculum for Preschoolers. This class offers daily learning experiences, enrichment experiences, and skill development that will help develop pre-academic skills and social/emotional skills. Class size will be capped at 26 students. Classes will be offered at QCE, JBE, GPA, and SVE. This course offering is contingent upon student enrollment. Children must turn three prior to September 1, 2019. Enrollment: There is a $50.00 nonrefundable enrollment fee for full day tuition or full day plus before and aftercare. Full-Day Tuition: $175.00 weekly tuition from July 24 through May 21 ($35.00/day). Full-Day Plus Before and Aftercare Tuition: $200.00 weekly tuition from July 24 through May 21 ($40.00/day). Registration for 2019-2020 begins on April 1.